The STSA Annual Meeting Exhibit Hall is the perfect place to showcase products and services to STSA members and meeting attendees. 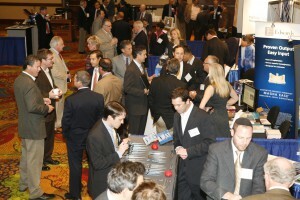 STSA’s 62nd Annual Meeting Exhibit Hall is selling quickly, and as of today just 15 booths are still available. Companies interested in exhibiting are encouraged to act quickly in order to secure their booth space. On Friday, November 6, the Joint Council on Thoracic Surgery Education will host a CT Surgery Resident Jeopardy Competition inside of the Exhibit Hall during afternoon meeting breaks. Learn more about the Competition. All coffee breaks will take place inside of the Exhibit Hall on Thursday, November 5 and Friday, November 6. Breakfast on Friday morning and dessert following the Friday afternoon All-Attendee Lunch will be served inside of the Exhibit Hall. The Exhibit Hall is conveniently located next door to the General Session room, and meeting attendees will pass by the Hall to and from key educational sessions. Due to the popularity of the 62nd Annual Meeting Walt Disney World® venue, STSA expects record professional attendance at the 2015 meeting. As of early-August, registration numbers are more than double what they were for the 2014 Annual Meeting at the same time last year. Learn more about exhibiting with STSA at www.stsa.org/exhibits. New this year, exhibitors can increase their on-site presence by purchasing select, high-impact branding opportunities. View a full list of options in the STSA 62nd Annual Meeting Branding Opportunities Catalog. Contact STSA Headquarters with questions by calling 800.685.7872 or e-mailing stsa@stsa.org.